bodice enhancing an hourglass image. Paired with cap sleeves, it is modest yet delicate. Sleek and sophisticated with a strong design element, this shape is appropriate in a formal or semi-formal situation. A removable train is a great way to add a bit more flair for formal events. Exciting venues such a yacht clubs, museums, private estates, or vineyards would all match this style. As for accessories, a bolero orcapelet is a great way to complement in cooler climates. The volume on top gives the illusion of even more curves - perfect for petite or more boyish figures. Silk twill duchess satin works with this silhouette beautifully. Lace designs can be especially fetching and sweet as well. We love details like ribbon or pleats and crystals adorning the neckline are a lovely way to add some unique elements. It’s no secret that we are passionate about mixing things up, especially texture, so we love this style when paired with flouncing ruffles and a delicate material such as silk faille, a lush combination of structure and softness. Imagine strong, crisp ruffles exploding into a flouncing trumpet style skirt, chic and visually stunning. 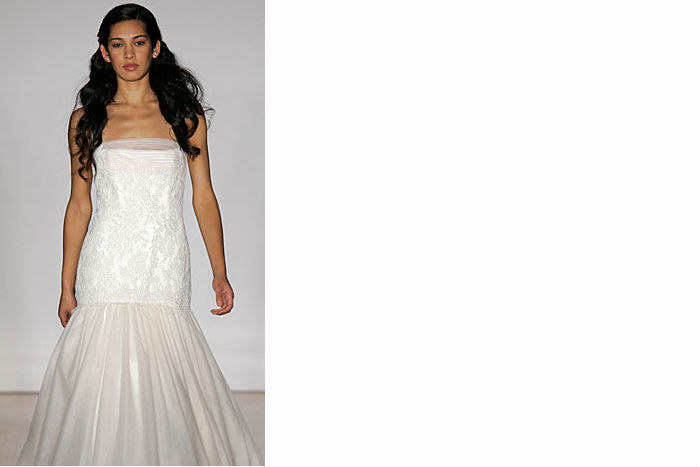 For even more flair, think of a gown with tiered pleats made from organza - exciting and inspired. This can be an especially dramatic choice, especially if one plays up alternating fabrics and lush details. See some trumpet gowns by Kenneth Pool, Angel Sanchez, and Vera Wang.